Black hair makes a statement. Many statements, actually... Classy. Edgy. Confident. Stunning. The impression you make when you change to a black hair color really depends on you, your personality, and the hairstyle you choose. To make sure you don't send out the wrong signals, think long and hard before settling on a black hair. For instance, an all-over application of blue-black with pale skin has a very youthful vibe. For a classy look, natural black with some reddish or brown highlights will soften the impact. We have Blue-Black (Raven Black) and then we have Natural-Black. 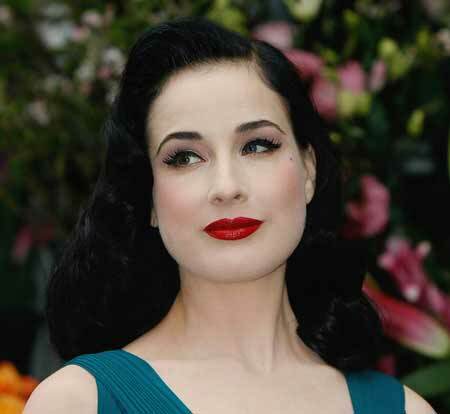 Watch for these two tones because there are slightly different - Natural black work great on olive skin tones and blue-black looks stunning on skin tones similar to Dita Von Teese Everything else that might appear black falls into category of natural dark brown. For example on (US Swatch chart 2/0), (Europe Swatch Level 1) for Wella Koleston Perfect is Darkest Brown ( Will appear black). - Black hair is bold. Does it suit your personality? 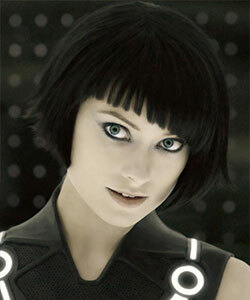 Many scifi-movie characters wearing their hair in short edgy haircut and black hair color as sign of strength, power and beauty and the look is just stunning! - Once you go black, it's hard to go back (unless black or dark brown are your natural colors). It requires a professional bleach job to strip the black away before recoloring. - If switching from a much lighter color, roots will be a constant issue. Be prepared to re-touch often. - Dying at home? Prepare for a mess. Black hair color stains everything. - Black hair is a commitment. Do you have the time, energy and money for upkeep? - If you want more natural looking results, make sure it suits your skin tone. Not everyone can pull it off! - Safe practice is to stay within 2 shades of your own natural color. - Get prepared to alter your makeup choices. With black color or in general with darker shades you might need much stronger eye makeup. You can easily get a wash-out look when you go for dark or black hair colors. A dust of bronzer and natural lip gloss will keep you look fab. Maybe it's the pop culture obsession with vampires or the whole Goth thing, but these days jet black hair color is so hot it has a shot at toppling blond from the Most Popular Hair Color podium. But it is more than just a trend! Medium Brown Hair to Auburn Or Jet-Black ? Tired of the Dark Color - Any Suggestions? I want Raven Black Locks!